1015 W. Colton Ave., Redlands, 92373, (909) 335-9024 The Ayers Hotel Redlands, boutique hotel is situated near the tree-lined streets of Historic Downtown Redlands, with picturesque Victorian houses, boutique shops, restaurants, beautiful parks, and cultural attractions. 1230 W. Colton Ave., Redlands, 92373, (909) 335-9988 Relax at the smoke-free Comfort Suites® hotel, located minutes from University of Redlands, Loma Linda University Medical Center and Esri. 1650 Industrial Park Ave., Redlands, 92373, (909) 792-7913 With a stay at Country Inn & Suites By Carlson, San Bernardino (Redlands) in Redlands, you’ll be near the airport and close to San Bernardino County Museum and University of Redlands. This hotel is within the vicinity of Loma Linda University Medical Center and San Bernardino Golf Club. 1235 W. Colton Ave., Redlands, 92373, (909) 793-6648 Dynasty Suites Redlands is a welcome oasis in the beautiful historic city of Redlands. Conveniently located off the I-10 and the newly completed 210 freeway, you’ll be minutes away from the University of Redlands, ESRI Corporate Headquarters, Loma Linda University Medical Center and the San Bernardino Convention Center. 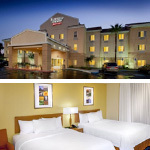 1041 E. Harriman Place, San Bernardino, 92408, (909) 382-4560 Every day is a great day at the Fairfield Inn & Suites by Marriott San Bernardino because each room is always bright, fresh and clean. 1675 Industrial Park Ave., Redlands, 92374, (909) 793-3723 A unique hotel with a Southwestern feel, featuring spacious, comfy rooms which circle a large pool, housekeeping and guest laundry services and centrally located. 27959 Highland Ave., Highland, 92346, (909) 862-8000 Check in to the Hampton Inn & Suites Highland hotel for a comfortable stay at a great price. Located in the center of New San Manuel Village, close to Interstae-215 and Highway 30, you are within easy reach of great shopping, dining and entertainment, as well as the Ontario International Airport and California State University San Bernardino and the University of Redlands. 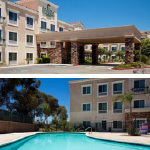 855 E. Hospitality Lane, San Bernardino, 92408, (909) 799-6500 Homewood Suites is an all-suite San Bernardino, California, hotel just minutes from Ontario International Airport, the breathtaking slopes of the San Bernardino Mountains and the beautiful beaches of Southern California. In addition, we are just four miles from the National Orange Show Events Center. Set on Hospitality Lane’s “restaurant row”, guests at this hotel can choose from dozens of dining options, all within walking distance. 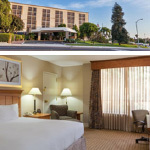 285 E. Hospitality Lane, San Bernardino, 92408, (909) 889-0133 Whatever the reason for your stay, The Hotel San Bernardino will put you right in the center of everything the area has to offer. 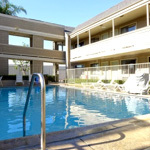 1160 Arizona Street, Redlands, 92374, (909) 335-1612 Prepare for your busy day using the free Wi-Fi Internet, recharge each morning with free SuperStart breakfast bonanza and unwind at night with a swim in our heated outdoor pool. 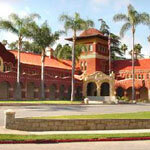 The Redlands, CA, hotel offers free large-vehicle parking so you can explore the area with ease.